Father Mateo was a member of the Congregation of the Sacred Hearts of Jesus and Mary. His health was restored at the shrine of the apparitions of the Sacred Heart in Paray-le-Monial, France, and that is where he conceived the bold plan of conquering the world, family by family, for the Sacred Heart. Pope Saint Pius X "commanded" him to devote his life to this work of Christian and social regeneration, and thus the Work of Enthronement of the Sacred Heart was born. Father Mateo's idea was that by entering a picture or a statue of the Sacred Heart into homes, each household member would be permeated with the love of Christ and would show it by a truly Christian family life. Extending his zeal even further, Father Mateo asked families to mount a successive nighttime honor guard for Jesus, King of their homes. Beginning in 1907, he traveled all over the world for forty years, imploring families not to leave Jesus standing on their doorstep. 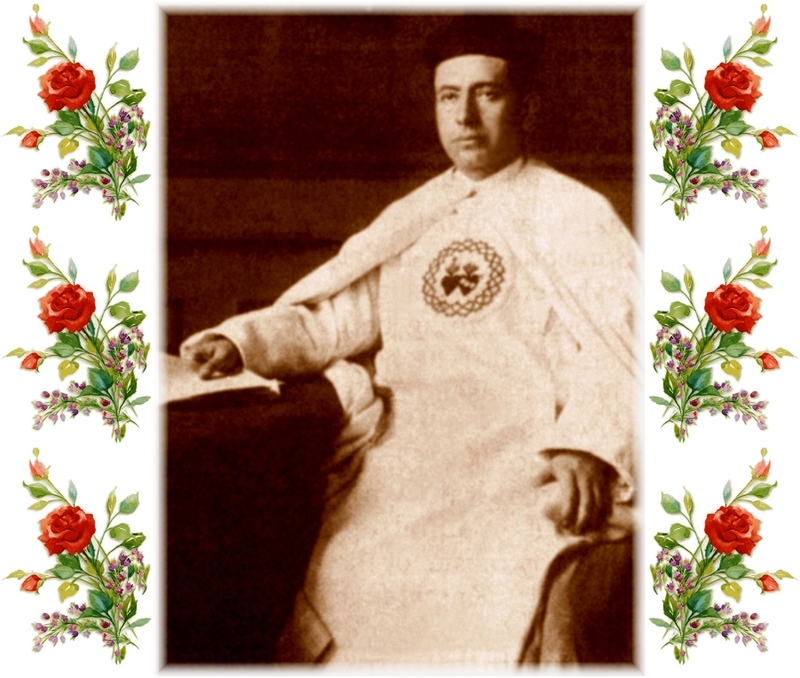 Until his dying day, he issued publications and launched campaigns in favor of reparatory Communion, daily Mass, the Rosary, and even of recognition of the rights of Christ in the UN. He preached more than seventy retreats in Canada alone. Father Mateo Crawley-Boevey, the great Apostle of the Sacred Heart passed away in 1960. It is not hard to understand the impact created by his conferences. Though this particular one was addressed to a Trappist community, it nonetheless reveals where lies the true secret of the most beautiful apostolate, even in the world, for all fervent souls who do not preach but who can love, labor, pray and suffer with Jesus. Can you be an apostle? This question asked by Father Mateo had already been formulated in the hearts of many among us [the Trappist monks in the Abbey of Sept-Fons], or rather in the hearts of all. Can anyone hear of the wonders wrought everywhere by the Work of the Enthronement of the Sacred Heart without wanting to do his little part? But what could we do? We are contemplative religious who have little or no relations with the outside world. "What do you mean?" Father replied. "You have secluded yourselves for the love of Jesus, the prisoner of love. And as a result of this sacrifice, you would be deprived of the merits of an apostle? That is impossible. It would be unjust. Not only can you be apostles, it is your noble duty to be so! "What is an apostle? A voice ringing out? Someone who bustles out? Someone who bustles about, who creates a sensation, a sower rushing here and there to sow the good seed? No, a thousand times no! Converting souls, winning them for Jesus Christ, is a supernatural work. Now, the supernatural operates only by means of the supernatural. Knowledge and eloquence alone cannot accomplish that work. It is not scholars or great orators that we need, especially at the present moment; it is Saints. An apostle is a chalice full of Jesus that pours out its overflow upon souls. Be full of Jesus, full of Divine life, and you will be apostles. "And where can you fill up your soul? Is it not in contemplation, silence, mortification and prayer -----all things that your life is made of? Consequently, who can be an apostle more and better than you? Far from saying that a Trappist cannot be an apostle, I would dare to assert that no one can be one without having the spirit and heart of a Trappist." This was certainly not the first time anyone had spoken to us about the fruitfulness of our way of life; but up until now, no one had ever done it in such a limpid and convincing manner. A few examples helped us to gain an even better insight into Father's thought. In Switzerland a parish priest came to him and said, "If you are looking for a soul that could help you, I know one who can. She is a young girl whose entire body is suffering. All that she has left is her head to think of God and her heart to love Him with. She can't come to church because she is paralyzed, but she would really like to meet you." Father went to see her, and he spoke to her about the apostolate, saying, "I want you to make me a gift of your illness and your sufferings. Are you willing to offer yourself as a victim of love to the Divine Heart in order to be an apostle?" With signs and eye movements, she showed that she understood, and that from then on she would offer herself for the extension of the Work of Enthronement. disappointed and pained, and after his Mass the morning of his departure, he said simply to Our Lord during his thanksgiving, "Lord, You know I am leaving with a heavy heart, because I have not met a single soul here who is ready to pray, love and suffer for the Work. If this Work I am preaching is to bear any fruit here, send me one of those little and generous souls who, following the example of Sister Therese of the Child Jesus, will offer herself up to pray, love and suffer for the reign of Your Heart." He had said this prayer three or four times when someone came and interrupted him, saying, "Reverend Father, there's a poor working girl at the door, a little nuisance who insists on seeing you and talking to you. But don't bother, I'll tell her to go away. All right?" "Oh no, bring her in." And the young girl was brought in. "Father," she said, "I heard you speaking about the Work. I would like to do something, too. If you need a little soul who, following the example of Sister Therese of the Child Jesus, offers herself to pray, love and suffer, please tell me." "Father, didn't you understand? I would like to be a little soul like Sister Therese of the Child Jesus, who prays, loves and suffers for the reign of the Sacred Heart . . . Will you accept me?" "In that case, Father, come to the chapel. I'll make my oblation to Jesus, and you will ask Him to ratify it." "Sometimes people say, 'Here is what Father Mateo is doing!' How simple can you be? Do you know who the true apostles of the Sacred Heart are, those who work the wonders I told you about and the others, far more numerous, that I am not at liberty to tell you about? It is these little souls, so very simple and above all very self-forgetful, that I encounter everywhere: in the Court of Spain and in castles, just as well as in little cottages and among the beggars at church doors. These are the ones who by offering themselves as a holocaust to the Sacred Heart in order to love, pray and suffer, are bringing about the reign of Jesus, King of Love. "Do you also want to be counted as an apostle? From Father Abbot to the last Lay Brother, you can be one, but on one condition: you must be Saints, at least through effort and sincere desire. Now you will say, 'That is very difficult, very complicated!' On the contrary, nothing could be simpler." And then, not without a hint of irony, Father Mateo told the Trappists about certain biographies that seemed to have been written for the express purpose of discouraging souls of good will. Stories of Saints who never sleep, never eat, never drink, never have any passions or undergo any temptations or combats, like the good foundress of a certain congregation who, if anyone were to believe her biography, had the genius of Saint Thomas Aquinas, the eloquence of Saint John Chrysostom, the purity of Saint Agnes, the meekness of Saint Francis de Sales, the seraphic soul of Saint Francis of Assisi, and on and on. And Father Mateo added, "If all that were true, surely the Blessed Trinity must not have known what to do when the time came to choose the Mother of God, and no doubt He was obliged to draw lots to decide whether it would the Blessed Virgin or that good soul. "No, the Saints are not little Angels fallen ready-made from Heaven. With the exception of the most pure and most immaculate Virgin Mary, they all had to endure temptations and combats. And this ought to be an encouragement for us. If they did it, why can't I? "So then, what is a Saint?" continued Father Mateo. "Here is the definition that I think is a sound one: A Saint is a person who lives by faith and love." Continued next page, click forward flowers.